Saree is an adaptable garb. Not only does piece of clothing brings out the best features of a woman but it enhances her curves in the most appealing yet graceful manner. It is a type of accoutrement that suits every woman, irrespective of her age. Moreover, it is one of those garments that can be draped in countless ways. This in turn allows every wearer to take it up a notch for substantial events or tone it down a little as casual wear. The traditional closet of a woman can comprise of an array of ensembles but saree will always stay close to the heart. Stealing sarees from mom’s wardrobe to owning a cluster, every woman goes through this beautiful journey. If you are in the latter half of the expedition, saree designs from the house of Kalki Fashion can make the reforming experience more memorable. Dive right into our online saree shopping spree to pick your pick from our range of exquisite designs, fabrics and colors. 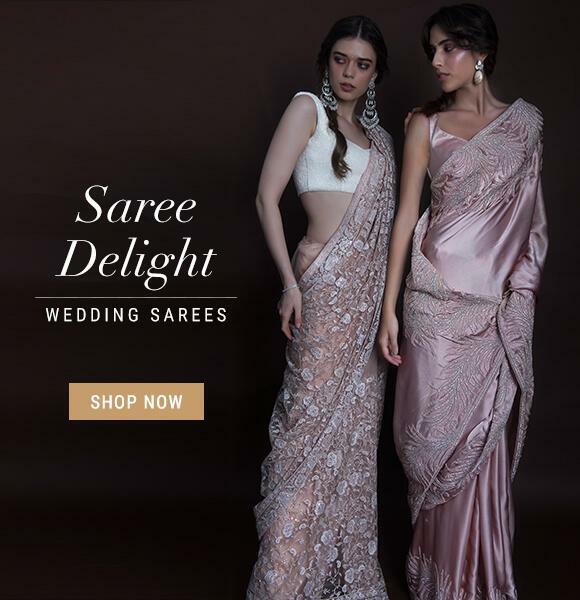 For women who are looking for saree options for their big day cannot afford to skip our handpicked collection of Indian Bridal sarees online. Our attires are designed keeping in mind the diversity in taste, up to the minute fads and materials that qualifies as nothing less as paramount. 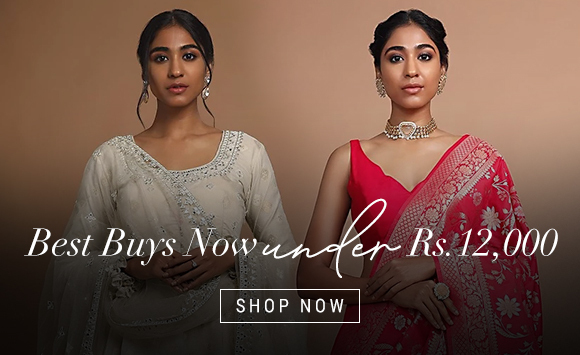 Whether you are a classic banarasi silk bride or someone looking for something as authentic as bandhani sarees, we have got your back with breathtakingly gorgeous pieces. Understanding how tricky online shopping can be we’ve ensured everything in your interest in covered. Shopping with us comes with a no-questions-asked and free 30 day return policy with a promise to deliver exactly what you see. With us taking care of all your doubts, you cannot stay back in the game of vogue. Put your shopping shoes and get trending because our gorgeous saree collection waits for you to explore it! No saree will ever feel complete without having the right complementing charms with it. Depending on the neckline of the blouse texture/print/motif of the saree and occasion for which it is to be worn, you can decide on the necklace or earrings. When jewelry selection is too much of a task for you, bring on a classic jhumka and a messy bun to look right on point; every time, any day!